After a few days in the great outdoors your camping gear can become absolutely filthy, and one of the last things people want to do right after returning to civilization is to clean their gear. A shower and a nap are generally much higher on the priority list. However, eventually, it is in your best interests to properly clean and repair your camping equipment before you place it into your self-storage unit. Tents are very expensive, and a little bit of effort keeping your gear clean, repaired, and properly stored will have a major impact on the lifespan and performance of your tent. Today, Affordable Family Storage will discuss ways that you can prepare your tent for storage after a trip to ensure that your investment lasts it’s full lifespan. Before you break down your tent at your campsite, pick the whole thing up and shake it out to remove large pieces of debris and dirt. Once you get the tent home wipe it down with a diluted mixture of hand soap and warm water. Make sure to never use detergent or abrasive cleaners that may damage the protective coating on your tent. Once you have cleaned the major areas, leave your tent up and allow it to completely dry before breaking it down. If you place your tent into self-storage with moisture remaining on the material, you risk major mold buildup. 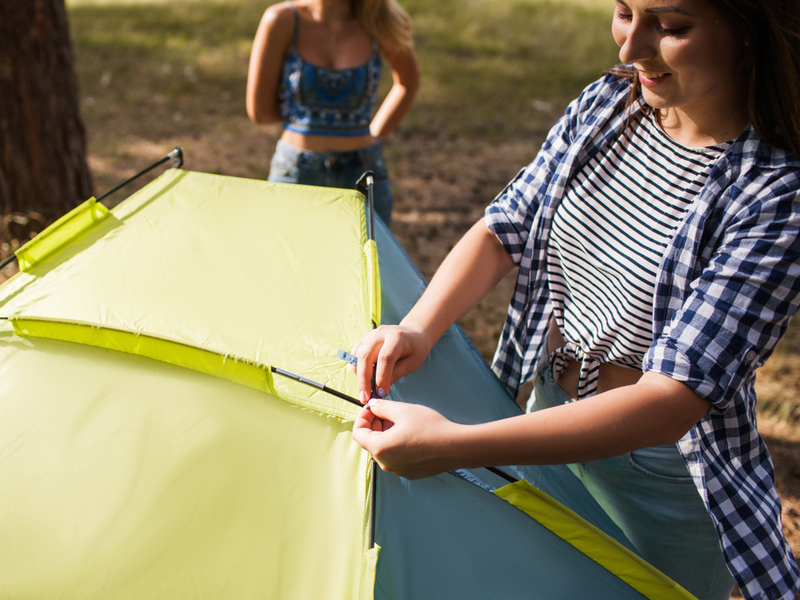 To repair small damage to your tent, you can use products like Aquaseal or Super Glue for seam reinforcement or to fix small holes and tears. You can also place mesh repair patches on larger holes. Remember to clean the tear with rubbing alcohol before placing the patch adhesive to ensure you get the best results. If your poles are damaged, it is generally a good idea to order replacements. Some people will create a “splint” on the broken sections of the pole using duct tape, but this can really compromise the structural integrity of your tent. After you have cleaned and repaired your tent, you will want to fold it flat along the seams. It can be tempting to just jam it into your stuff sack, but ensuring its folded and flat before placing it into self-storage will extend the lifespan big time. Once you have your tent prepped, make sure you store it in a location that will protect your tent from moisture buildup. A climate-controlled self-storage unit at Affordable Family Storage is the perfect location. At Affordable Family Storage, we offer premier self-storage options for your tents or other camping gear. Our climate-controlled, environmentally protected self-storage units ensure that you do not have to worry about moisture damage from fluctuations in humidity. Contact Affordable Family Storage to learn more.